Pre-Plan your events: When you plan for an event, or meal, you have a structure to follow. One suggestion is to eat clean Monday through Friday so you can enjoy that one splurge meal on Friday night or Saturday. Then get right back to your structure the very next meal. Follow the 90/10 rule! Your body will respond to what you do 90 percent of the time. So one meal 'off' a scheduled program will not hurt you. Two meals 'off' will not hurt you. However having only one healthy meal a day will have detrimental effects on your progress. 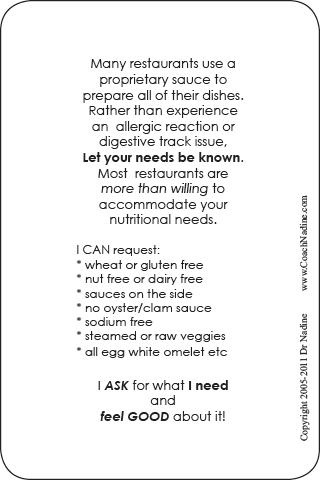 Notify your hostess or restaurant of any Wheat, Dairy, Nut or Soy allergies so they can better serve your needs. Ask for what you want in the restaurant rather than simply selecting off the choices provided within in the menu. As an example you can say “I would like 4 ounces of grilled salmon with two cups of steamed broccoli with no butter or salt added and a half a cup of rice. You can request your salad dressing be provided on the side. 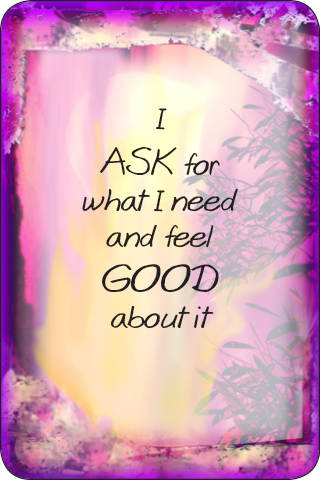 Remember this is about owning your nutritional needs. Eat before you go. You can have a large salad with others, add some lean meat if you desire. Bottom line. DO NOT ARRIVE HUNGRY this will only lead to over eating then over groaning. If you are eating in a buffet style get-together, walk the entire food line before putting anything on your plate. Choose 2-3 items you would like to explore then put a small portion (tablespoon) of that item on your plate. You can always go back for more if you enjoyed it. Use a salad plate rather than a dinner plate at the buffet. Drink a glass of room temperature water before starting your meal. The water will aid your digestion and notify you sooner that you really are satisfied/full. Put your fork down between bites. Use smaller fork. Throw away your plate when you are finished eating. This will remove temptation of hand to mouth disease. Choose water or club soda with a twist of lime if you are at a group gathering where alcohol is being served. You do not have to have alcohol. Most folks simply want to make sure that you are OK...So if you are walking around with a club soda with a twist of lime or something similar you will most likely be left alone. Another consideration for alcohol is that it tends to turn your head towards high fat, high sodium and high sugared foods. By keeping to a club soda you will stick with your PLAN!!! Enjoy the conversation as you are eating. BE PRESENT!! BE CONSCIOUS!! The never ending Office Cookie Plate ~ I used to laugh when I'd go into the conference room, see the table loaded with junk food, and listen to everyone complaining about gaining 30 pounds with grazing. With all that sugar in the body, not much work got done later either, but what to do with all that FOOD??? Make a suggestion for all the food be placed in ONE spot, preferably a place you will not see or smell. Most over eating is a head game. If you can't see it, you won't want it. It is that simple. Suggest there be only ONE day for excess food. When you do eat the food, keep it to one room. Avoid taking it to your desk. That will only lead to mindless eating. Give yourself permission to have one junk food item out of every 9 healthy food items (that 90/10 rule). Visualize something covering the food, something you KNOW you would not eat. When I am in restaurants I use salt to cover the food I no longer want to eat. Find something that works for YOU. Breathe the Food Aroma. Sometimes all your brain needs is a good whiff of some good chocolate. I am very well known for standing next to someone who is eating a candy bar and sniffing the air as they talk. My brain gets the message about chocolate and my hips keep the message to stay slender. pre-planning is the key for success. You totally deserve SUCCESS!!! you give you and your guests the gift of self-care, self-love and selfempowerment. Much love, and appreciation to each of you. iTunes http://bit.ly/kqnLcG for your iphone/ipad/ipod touch device.